After choosing the theme of fairytales I decided to take a look at locations that fairytales are often set. Castles, churches and enchanted forests were the main thing that came up when I searched for fairytale locations. I decided to shoot my photographs in the forest as I think I will be able to get photographs that show the eerie forest but are brightened up with the colour from the smoke bombs. I think in quite a lot of gothic fairytales by the Grimm brothers for instance,there is a lot of dark more sinister scenery involved, almost more gothic. However I still want to maintain the the ‘Happy Ever After’ aspect of fairytales by keeping the bright colours from the smoke bombs. The other thing I looked at was fairytale attire. Most often in fairytales there would be a princess or a fairy so most of the outfits are quite bright and look like dresses. I then searched gothic fairytale princesses and fairies and managed to get a lot more different styles, I quite like the darker colours from the gothic fairytales and think it will match well with the eerie woods and the bright colours from the smoke bombs. I think I will be able to create a decent mix which shows both aspects of fairytales; the pretty and innocent side that most children see, and the more sinister and gothic side that you might perhaps pick up on as an adult. The aim of my photographs is to show both sides of fairytales and to then write an essay based on how as you grow older your mind changes and what appeared innocent when you were younger holds a much deeper and perhaps more depressing meaning. Following my research of coloured smoke bombs,I was going to go down the route of using the colour to bring out the life or changing of life/coming of age in the photographs. However I have since changed my idea to instead use the brightly coloured smoke to instead create mystical, fairytale style photographs. I thought I would do this as I would be able to create better photographs and also would be able to write about something more interesting in my essay. As we have to write about the underlying theme, I thought I could use fairytales relation to life and growing up. I tried to do the photo shoot in the abandoned school only to realise that for the first time in about 3 years they were actually doing work there and removing the asbestos, it is probably for the best but I was still a little disappointed. Instead I am going to take my photo shoot to the forest as I think forests are quite often seen in fairytales. 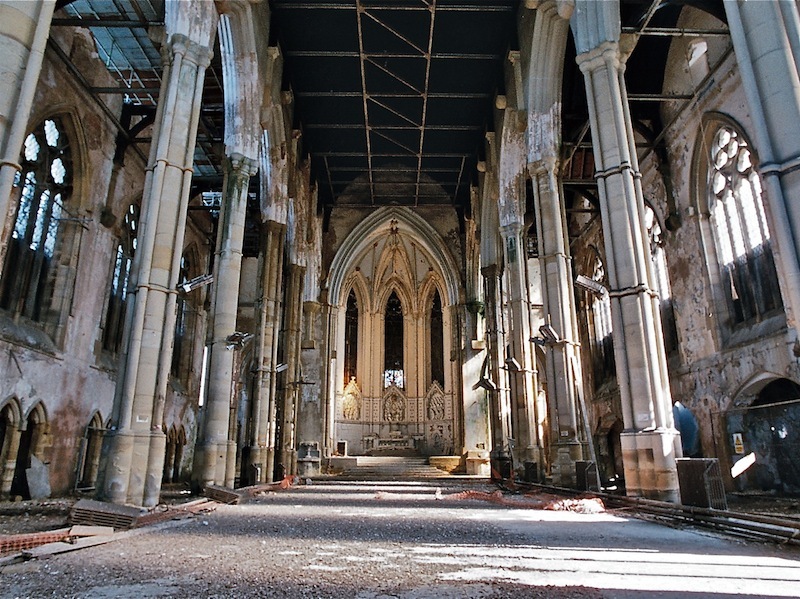 Ideally I would have liked to have done my photo shoot in the abandoned famine church in Leeds, I think that this place would have worked well with the bright colours of the smoke and also because churches are often seen in fairytales for princesses etc. Due to time and money restraints I had to stick to the forest, I would have otherwise hired a professional model who could have had hair and make up done and a full wardrobe of clothes to wear. I would have been able to afford my own lighting which I could have taken to the church and could have produced images of professional level. This famine church would have been ideal due to the big amount of open space and the fairytale like structure of the whole place. I could have kept in with Hiroshi Sugimoto’s style of big open empty spaces then. I have found that this report took more time than I perhaps thought it would, I noticed this when I was updating my GANTT chart that I had clearly gone over my own personal deadlines for what I had wanted to achieve. I spent a lot of time looking for references and reading articles. I got too drawn into an article and then would read another article based on that one. I ended up reading about stuff that wasn’t really relevant but was quite interesting about my research. I think the hardest part was trying to find so many academic references and paraphrasing them, with only 4000 words allowed I was finding it hard to paraphrase things and still be critical of the literature. I very vaguely estimated at the beginning I would do 500 word intro 500 word conclusions,30 references paraphrased being about 100 words each. This turned out to be a lot more and I had to cut down and rewrite a lot of my work. I think that my final research report is very accurate and detailed. The information I have gathered for the report is all useful and sticks to my objectives well, I think that I will find it easier in the second semester to write a decent story because of the information I have gathered. Also I feel that by following my GANTT chart better now that it is better planned I will stick to deadlines and get higher quality work produced. As a whole I think that my website is quite good. I think that it shows my ambitions in what sort of journalism I do, in my about section it explains that I am mostly a sports journalist and photographer but do dabble in other photography. I think it showcases my work well and shows that I can do an array of work. I think the general layout of the website is quite clean and easy to navigate around. I particularly like the homepage with one of my photographs as the background, I think having a homepage with a photograph and an entry gives a professional effect rather than just going straight into everything. My website is social media friendly, with the ability to tweet or Facebook the photographs or stories that are on my website. One thing I dislike about the website is the curations page, it annoyed me a lot that you could not get rid of the gap between the heading and the actual curations. This was something I spent a lot of time trying to work out and got nowhere. I have found out along the way just how hard it is to make a website, having never made one before I thought it would be fairly simple, but each time I started making a website I would encounter numerous problems. Not being able to code was quite a problem as I think it would be easier to make things a lot crisper and neater. Also website creators that I have used I have encountered problems with, resulting in me changing my website about 3 times. Eventually though Portfoliobox was a good website creator and was much easier than the other and still produced high quality. Overall I think I have found that with this project to create a truly professional portfolio I would have to pay money to use a decent website creator as although some of the free website creators are very good, they just don’t fully match up to a professional page that you would pay for. I have looked at some other students websites who have all used free website creators and think it is quite hard to produce something that is truly professional without spending money. After I graduate University and can afford to run my own website then I think I could produce something of much higher value and quality. Updating my GANTT chart was quite a challenging aspect of this module. It wasn’t so much that I found it tricky,more that because I wasn’t used to it I was spending a lot of time trying to make it good and efficient and encountered a few problems a long the way. I got fairly frustrated with it because as soon as you change one thing,it changes everything else making it quite hard to alter a mistake you have made or to change a date. However in the end, after quite a while I managed to sort my whole chart out and had Baselines that showed the progress of each week. I think that now that I have got the hang of the GANTT chart, semester two should be much easier as I will be able to quickly produce a GANTT chart that will help me keep up to date with all my work and will therefore increase proficiency meaning my work should be of a higher quality. Baselines and tracking your GANTT.. In semester 2 we will need to update the GANTT chart each week to help keep up with deadlines. Baseline is a set of key original project estimates. If your pitch estimated a task time of 5 days but it actually took you 10,needs to record variance of 5 days. Evidence of background reading and acknowledges research of others. Easy to trace the background research used. One problem I encountered whilst using portfolio box was for the curations.Every time I added a curation it would be miles down the page. Then if I went back to edit this it would delete it, so every time I wanted to edit the curation page I had to copy and paste the embed codes from my curations repeatedly. They would still end up being down the page which was very annoying. I realised that there was not really any other way to sort this problem out other than to just put an advisory at the top saying to scroll down. This makes my website look less professional but it was something that I spent hours trying to sort out and there was no solution.